SPYSHOTS: High performance Opel/Vauxhall/Holden Insignia spotted - AWD, twin-turbo V6 up to 400 hp? 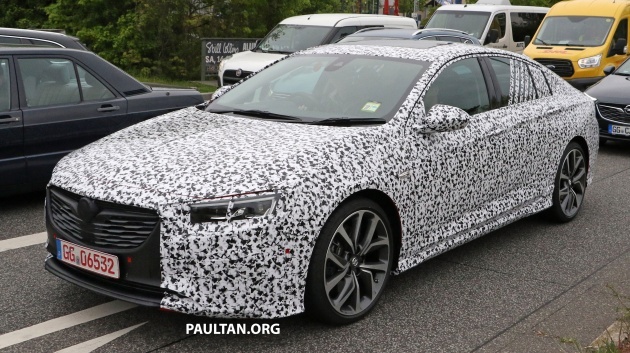 Home » Cars » SPYSHOTS: High performance Opel/Vauxhall/Holden Insignia spotted – AWD, twin-turbo V6 up to 400 hp? SPYSHOTS: High performance Opel/Vauxhall/Holden Insignia spotted – AWD, twin-turbo V6 up to 400 hp? 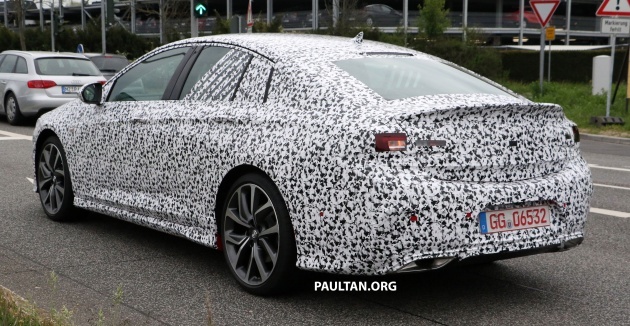 Our spy photographers have spotted what appears to be a high-performance variant of the Opel/Vauxhall Insignia, seen testing in Europe in right-hand-drive guise. The upcoming sedan is rumoured to be powered by a twin-turbocharged V6 engine with outputs in the ballpark of 350 hp to 400 hp, possibly mated with an eight-speed automatic transmission. The Insignia’s all-wheel-drive system comes with torque vectoring, and at the rear, a pair of electronically-controlled multi-plate clutches take the role of the rear differential. These can be expected to have specific calibration for this high-performance model, rumoured to adopt the OPC name, to signify Opel’s high-performance arm of products. The Insignia Grand Sport made its debut at the end of last year, and that was followed by the Insignia Sports Tourer, which was launched in February. As usually is the case, the high-performance model is usually the top of the range, and here the OPC can be expected to come fully loaded with equipment on the standard Insignia including IntelliLux LED matrix lighting, Lane Keep Assist, Head-up Display, and more. In the United Kingdom, where the Insignia is identified as a Vauxhall, its go-faster badge is the VXR, previously applied to models such as the Astra, Corsa, and the VXR8 incarnation of Holden’s HSV Clubsport sedan. Fuuyohh pijot P1 Perdana AWD twin-turbo V6. A Holden, not made in its home country. Opel is a brand that can be used BY GM in this region (and Asia in general) because of its german roots..instead with get crappy under engineered GM Korea stuff that’s no even near Hyundai/Kia…. .I know there are plenty of underlying reasons why Opel is not active in Asia but as sales are dying in Europe…it’s now or never..perhaps PSA who is rumoured to be buying the brand will do a better job..Opel is a brand that is waiting to soar in Asia.